We advise current and/or former staff to report any abuses you may have witnessed while working at Re-Creation Retreat. For information on your rights and how to take action, visit www.heal-online.org/blowthewhistle.htm. If you were fired or forced to resign because you opposed any illegal and/or unethical practices at Re-Creation Retreat, you have the right to take action. If you were harmed (family or survivor) by Re-Creation Retreat, please contact info@heal-online.org if you remember the long-term employees and from which years. This will help! Also, if you recognize any of these staff as having worked at another program, please send in any information about their past or present employment at other facilities and/or cults. Please don’t place your loved one in Re-Creation Retreat and rescue them if they are there now. Source: http://azbbhe.us/ProDetail.asp?ProfID=45615 Christie is not a licensed therapist. Christie is solely licensed as an associate counselor and only since July, 2010. Guy Finicum Therapist Finicum is a licensed professional counselor only. Finicum is not a licensed therapist. He has been a licensed professional counselor since 2006. Source: http://azbbhe.us/verifications.htm **See article below. Amy Hook Academic Director The AZ Office of Educator Certification was unable to verify Amy Hook's licensure. They require additional information, such as her birthdate, in order to proceed with the verification process. Clayton Taylor Staff Reportedly Daniel Taylor's brother. HEAL is in the process of reviewing the enrollment materials and handbook for this program as was downloaded from www.re-creationretreat.com on August 21st, 2012. RCR is a private, for profit, behavioral modification program. My first impression upon arrival there was their method of maintaining control over the girls in the program, a method that highlights emotional, physical, and pharmaceutical force into submission. Girls are told upon arrival that their placement in RCR was entirely of their own fault, and reminded daily that until they meet the expectations of both the program and their parents, they will be unable to return home. Regardless of how ludicrous some parents’ expectations may be, RCR upholds whatever is requested, and promises parents they will modify their daughter’s behavior accordingly. RCR keeps parents happy, because the parents pay the bill. RCR explicitly told girls that if they tried to run from the program, they would have no success, as the staff were instructed to restrain any girl who attempted. I’ve witnessed many of what they deem restraints, essentially the grown men who staff RCR outright tackle the girls to the ground, and refuse to release them until, by way of yelling and force, the girl is again submissive and agreeable to whatever the staff deems the girl should do. These restraints were not used simply for run attempts, however. I often saw them for things as small as talking back, or once for a girl not wanting to take off her socks, because quite simply her feet were cold. The girls are told it’s of their own fault that staff ‘had to’ restrain them. On one occasion, staff at RCR had given me letters from my grandmother, letters they were restricting because they were not from my father. When they learned that I was in possession of those letters, I was accused of stealing them. This accusation was made when I was brought into a therapy room, after requesting a therapy session because it was the date of my mother’s death. RCR does not confront its shortcomings, but rather places blame on the impressionable adolescent girls in the program. Not themselves, they contend they do only good; not the parents or sometimes dysfunctional families, they are the paying clients. Essentially, any circumstances there that would be looked down upon go unheard of; RCR restricts any access to outside communication, whether it be a letter to a friend or a call to the police. The only calls allowable are the single call per week we may get from our parents if they call in, a call which is monitored by the staff, and we are instructed as to what we can or cannot say. The staff listens to the entire phone call, which they justify by saying they are preventing us from “manipulating” our parents. Manipulation covers everything from begging to be removed from the program, or even just truly speaking of the injustices that go on. RCR never wanted us to say what really goes on there out of fear that our parents would learn the truth, and quit paying them to provide services. Even when I had first gotten there, and asked to speak with my father to ease my distress, they told me they would ask him if he wanted to talk to me. They said he didn’t, but in actuality, they never asked. I had been forcibly isolated from my family, friends, and all that was familiar to me, to be put into an environment I felt alone in. This was no state of mind to be in when being told I had issues I needed to fix. These practices I feel to be physically unsafe as well, after one event I witnessed. A newly arrived girl bunked in my room had awoken in the middle of the night, gone into the bathroom and removed the rear porcelain cover of the toilet, and threw it at the mirror. This woke us all up, and our room alerted staff when the girl proceeded to stab herself with the shards of glass. We never received any therapy after this event, something that still sticks with me today. Randy and other staff simply sat us all down hours later and told us not to talk about it, there was no need to alarm girls who didn’t witness it. My father was appalled at this when I had finally gotten home, he told me he had never even been told it had happened. I was unable to tell him from within the facility because I would’ve been “consequenced” (their term for discipline) had I said anything on the phone, and neither Randall nor the staff had ever informed any of the parents. Over time, I began to truly believe that there was something horribly ‘wrong’ with me, as if I were undeserving of returning home until I became submissive to the program. I picked up on this quickly, and was the fastest girl to finish the program after seven and a half months, though it usually takes from 9-14 months. This may have something to do with my dad’s refusal to pay. I realized I had to become submissive and obedient, it didn’t matter to Randall and the other decision makers what sort of progress I made therapeutically. My biggest issue going into RCR was the relationship with my father. I only got two “family therapy” sessions with my dad, therapy sessions which are done via telephone. No work was done to reconcile my home environment, or educate my father about how to better offer support upon my return. My individual therapies were with a woman named Sharla Christie, and were often discussing politics, or philosophy; nothing truly therapeutical is offered at RCR, and their highest qualified professional is Randall Soderquist, the owner/operator, who is a LCSW. Randy was still somehow able to get medications prescribed to girls to keep them from acting out. Punishments were absurd, an example of which being when I had set out two separate meats to thaw. I put them both on the same tray, and because one of the packages had leaked and contaminated the other meat, I received a write up under label of carelessness. The consequence for this was scrubbing the walk-in freezer on my hands and knees, in a t-shirt and shorts, for three hours. They deemed it a “work project”. When I, and the other girl who was consequenced with me, complained of being cold, and the fact that our knees were freezer burnt, we got another write-up for “breaking silence”, or talking when we weren’t allowed to. The program itself is 5 “levels”, consisting of reading a few self help books and writing papers on them, getting 400 points per level, and showing progress towards newly modified behavior that was in accordance with what parents outlined they expected from their daughter upon admission. A typical day would get someone a maximum of 10 points, however these points were easily lost if someone cursed, lied, talked when not supposed to, etc. Points are earned in what they deem group therapies, which are often watching TV, such as Dr. Phil, A&E’s Intervention, or cooking shows, and taking notes or answering repetitive questions generated by the general staff, who are not qualified in therapeutical services whatsoever. Even more alarming, is the month long ‘home visit’, which is essentially a test to see how the girls will do, ending with our inevitable return to RCR. All this placed the burden of therapy on the girls themselves, a forced manner in which they and I learned to unhealthily refrain from confronting issues within ourselves, as well as within our families, for the sake of fitting the mold and being able to return home. I give HEAL permission to use this statement. I declare under penalty of perjury that the foregoing is true and correct to the best of my knowledge. Executed on August 23, 2012. The police report posted below is what was filed by the Fredonia Marshal's office, after they responded to a call made by Randall Soderquist, and received only his self-serving side of the story in regards to my attempt to rescue Cassia from RCR. I highly doubt Cassia would say, to an officer of the law, that all she wants to do is get high off meth and die young. I believe much of the language, and the intimidation tactics, do nothing but show the alarming complete and unquestioning support of RCR, even by elected Marshal's of the law. RCR is on an Indian Reservation, therefore has quite a bit of legal leniency, and the town of Fredonia essentially regulates itself. "We do not have anything prior to 2010 because the ReCreation Retreat did not exist in Fredonia. The address where this is located was a motel /restaurant." The above case references and quote are directly from the Fredonia Marshal's Office in AZ. HEAL received this information on February 7th, 2013. ** Does Domestic Terrorism Run in the Finicum Family? Guy Finicum is the brother of now deceased (after shoot out with federal authorities) Robert LaVoy Finicum. Source: http://www.arkansasonline.com/photos/2016/feb/06/449381/. 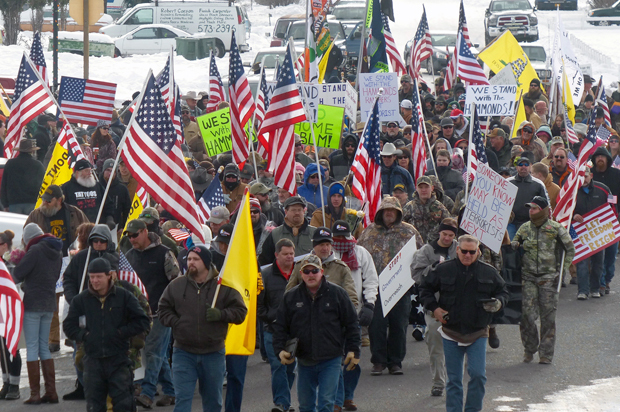 The Finicum clan claims Kanab, UT as hometown. Kanab, UT is less than 10 minutes away from Fredonia, AZ. If you honestly believe this program should be allowed to operate and that domestic terrorists and/or their families and associates should be running private slave camps for youth while charging families extraordinary rates for so-called "faith-based" treatment, then there is truly nothing more for us to say. Because, that's just plain crazy. Don't send your kids to Re-Creation Retreat nor any other such program. Take your blinders off. Protect yourselves and your kids from frauds and madmen.